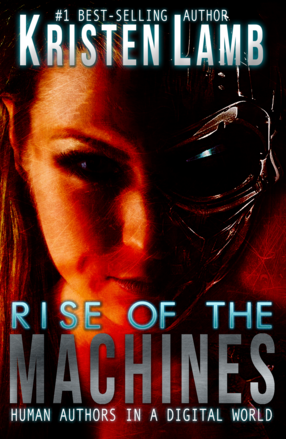 I have been reading your latest book Rise of Machines–Human Authors in a Digital World. As far as I am concerned, you deserve every GOOD thing that comes your way. Thank you so much for writing this book. It is exactly what I have been looking for! The information you provide is worth a hundred times what the book cost me! Thank you so much! What a beautiful post. Sorry for the silly question, but what is WANA and where do I join? In the land of writers I am a newborn, lol. You can find us on Facebook on our page or on Twitter at #MyWANA. Just jump in! The more the weirder…um, merrier :D.
Thank you! I followed you on twitter. I’ve joined in a bit on this idea but I haven’t seen much in terms of real relationships and community out on Twitter or Facebook around WANA. I think it is simply very difficult to get truly “in” with what is primarily a group of friends that is already well established. I am certainly interested in banding together with other authors. I see a lot of people doing good things and achieving a lot when groups of friends support one another. Maybe it will simply take years for some of the new people find their groups. It will be easier for those who aren’t geographically isolated, technology or not. I am new too and geographically isolated. While I have been able to get my feet under me more or less alone, I would be much happier not alone. My friends (who mostly just don’t happen to be fellow writers) could tell you that I’m a good one to have at your back. Still I don’t spend hours a day on social media, given writing, family, work and so on. I am there some and I prioritize the real connections between people that build a supportive community. I hope to know more writers who are serious about this WANA idea better. This post really spoke to me, Kristen. Thank you. I wasn’t sure just what WANA was, so I looked it up. Sounds like just what I need, so I signed up. Looking forward to connecting with some wonderful writers. Wow, Kristen, wow. Two amazing posts, one after another. the helpers need help too. you are amazing. just feel better! Thank you. Eloquent and inspiring! Thank you for all you do, and remember that for every person who speaks up and thanks you, there are a BAZOODLE of us out there nodding and fist-pumping right along with you, even if we don’t say so at the time. Please don’t ever stop what you’re doing. You do make a difference. Great stuff, Kristen (and it looks like I’m the only guy here! *G*) Anyway, your words really struck home. For various reasons, all my published Christian novels have died a slow, painful death, and lately I’m wondering if this whole thing hasn’t been one massive mistake. Good to know I’m not alone! Fabulous post. Thanks so much for the inspiration. Some of the most rock-solid contacts I’ve made since staring toward my dream have come through WANA. For that alone, I appreciate your efforts. You’ve really brought together some great people. Not everyone clicks with everyone else, but at least we have a chance to come together and “mingle” to see who’s a good fit. Please let me know if there’s some way I can give back. What a beautiful post. You are indeed a very special lady. I’m not on Facebook or Twitter, but reading your posts (and the community of comments) definitely helps me feel Not Alone as I chip away at the ‘silent years’. Thanks for everything – and definitely don’t give up! This is such a great post. The quote from your minister is appalling. I’m writing a post for Sunday about the Dream-smashers and Crazymakers who try to sabotage our careers. I’ll link to this post. Great post, thank you. I’m really lucky. I have the WANA community’s support AND I have my family’s undivided support. Well…except for one cranky aunt. I guess she would qualify as a Dream Smasher. I just ignore her. Great post, Kristen. You’re the example of ‘what doesn’t kill you makes you stronger’. You’re both strong and triumphant. I’m sure everyone gets overwhelmed sometimes and I’ve certainly been there. I’ve been lucky to have a lot of support though, from family, friends, and fellow writers. I think I’m also fairly good at stepping away from those who are shin kickers, and that helps too. Great article. I agree, Susie Lindau is wonderful. You give so much with every word you write, Kristen. I’m glad you’re getting some of that caring back when you needed it. ps…. i haven’t sent anything out that i have written. These posts are NOT an indication of how i write. I have many books in me and i have a heart condition and keep thinking i will write MORE when i am unable to keep up my schedule. once i cleared my mondays for writing. and every week, i swear, every week by the time i cleared off my desk and working space, made the coffee and sat down it was time to make dinner!!!!!!!!!!!!!!!! LOL humbling as i know many moms who write novels in t he middle of the night, wee hours of the morning, etc. I am a single mom of 3 adopted kids, after fostering 31 (hence the book!) , taught piano / voice lessons for 40 yrs and been a minister for 15 ( Crossing over/ transitioning, doing it all for many years!) HENCE THE HEART CONDITION! so here i am living a very fullfilling life, my twins are 17 and my oldest boy 20 and i am NOT DONE YET! LOL so perhaps this sharing with you will cause me to set aside some writing time. I have notes written all over the house for THE BOOK(S) . : foster care/ adoption as a single, ill mom. MInistry as a free lance minister with no one to answer to except GOD, and perhaps the one where we meditated and separately and came up w/ the same past life scenario, knowing we had an attraction in this lifetime but not why til we meditated. WOW that was poignant. i think that one might be ready to send………… i would love to hear what subjects others are writing about! please forgive typos. i am pretty emotional right now. wound up if you will. You make such a difference, and never moreso than when you share your humanness and struggles. I’m a baby writer, and I know God directed me to your blog and WANA for support and direction. While I’m no poster child for WANA involvement, I know what I’ve gleaned and intend to keep going because I have been made to believe it matters. Ongoing prayers for you and your family. Thanks for all you do. Thank you. This blog post had me crying in all the right “one with the universe” ways. Thank you for being you and sharing that you. You’ve been very kind and extended your hand to others, so I’m glad they’ve turned and done the same for you. I bookmarked this one, Kristen. Thanx. I read this post with interest and stirring. To answer the questions you put forward: Writing for me has been lonely even though I have been in communication with a few writers, but mostly distant. I have not had a WANA there to help me. Discouraged and overwhelmed are common for me, both right now. I can’t say anyone makes fun of my dream, I do have a few among my family and friends who believe in me – more than I do, which may be the problem. Even so, I think it may be good to connect with WANA. This was inspiring. Thank you. I can’t imagine that there are too many jobs lonelier than writing. Most of the time that’s fine, but occasionally there comes that difficult day, that day when you’re already tired, you complete a painful scene, and you’re alone. So, you end up huddled in the shower balling until it passes. Yeah, some days are like that. Yet I love this more than anything. There’s alone, and then there’s alone. A person can go about life for a good many years thinking they’ve seen and experienced just about everything. Then, whammo, hang on, because you ain’t seen nothing yet! So there I was, minding my own business, family, job, 46 years old, writing, and in good health… or so I thought. I’ll spare the details, but six months ago I was diagnosed with colon cancer and have been doing the chemo thing ever since. It’s like losing every other week in terms of anything resembling normal. The point is, having cancer is one of those things that can really isolate a person, even with family and friends and faith and support. At night, staring at the ceiling after the lights go out and playing what-if… now that’s alone. The crucible of crisis, the hammering on the anvil, the knight whose armor is no longer shining because it’s just had the crap beaten out of it places the kitten on the four-lane, if you know what I mean. The challenge in these times is just to keep moving forward, never mind writing. But wait, writing is something I like to do and even though no one seems to care overly-much one way or another, as long as I keep my real job, there is something about it that means I need to keep going. And in the meantime, I still get the occasional pizza money on my e-books. I look at writing, or even the will to keep writing (and will without result is like diddly without the squat), as a form of therapy, as proof that, in the words of one famous movie, “I’m not dead yet.” So, maybe what I’m saying is that to keep writing in the face of extreme isolation and wanting to give up is evidence of something greater and that this whole writing thing is a little more important than just another hobby or something I think I want to do. Kristen: I love the galaxy image! I am still reading your book 9the chapter on facebook) and enjoying it. Your WANA creation is great! I just started reading your blogs, and think you are awesome! Kristen, MyWANA is just fantastic – a totally awesome thing you’ve created for writers. Writers are NOT alone – and you’ve given us all a way forward – together, worldwide. Wonderful, wonderful, wonderful! Thank you so much for your generosity and selflessness in pushing it through. All kudos to you. Kristen, you are amazing. I don’t remember how I found you, but I know that if I hadn’t I wouldn’t be a published author today. I wouldn’t have had the courage to even try and the thought of self promotion was way above my abilities to even think about. You and your books have been my inspiration. I’m half way through your new book Rise of the Machines Human Authors in a Digital World and it has inspired me anew to keep improving and to just be who I am. I don’t know if my book will ever go viral or even sell moderately, but I know it won’t because I didn’t have great advice. Thank you! Thank you Kristen. What a beautiful post. I love reading your blog. It’s helped me in more ways than you can imagine. I am learning so much from all these posts on this blog! THANK YOU ALL! Kristen–Do you read these comments? What you do makes a real difference! As for me, your craft posts helped me more than any other book or tutorial. They are concise and on topic and easy to implement. But, girl, they are also HUMAN. They make me laugh, for heaven’s sake. I can’t thank you enough for WANA. You are the perfect Jedi. Yes, loneliness and self-doubt are likely the “Tweedle Dee and Tweedle Dum” of a new writer’s life. Regarding “literary agents being downright cruel to new authors,” I find it fun on occasion to revisit the interesting responses received through the years (yes, I keep them, sort of like Stephen King’s “nail on the wall” from his early years), that ranged from Dear Occupant” to a mimeograph slip of paper with “No Thanks.” I have a wonderful agent now who believes in me, we’re still raking the oyster beds for that pearl, but onward we write. If your intent, Kristen, was to inspire and encourage through WANA, you’ve succeeded to rock star status, adored by those who follow you regularly. Don’t ever doubt that what you have accomplished is absolutely amazing. I’m googly-eyed when I think about how much I’ve learned from the courses and conferences in the last year and a half. Mostly, I’m grateful for the incredible community of people and all the friends I’ve made (and even met in person). We joke about being in Hotel California, but the WANA1012 class likes it there. We are not alone, and you aren’t either! Mwah! Kristen, This makes me realize how grateful I am for a husband who supports my writing. I am going to tell him (again) today how much that means to me! Long story short: I wouldn’t still be writing today if not for the support of other writers. WANA has been a godsend. I’ve received encouragement, information (by the way, GOOD information–WANAs have a reputation for not throwing out stupid stuff willy-nilly), and prodding when I needed it. Not to mention all of the laughter…oh, the laughter! Thanks for being one of the best connectors ever. I love that WANA is a wonderful community of writers of any genre and welcomes anyone from any part of the world. I live Down Under (Australia) and feel connected to you and the rest of this wonderful community of writers. I know I can reach out and a fellow WANA will be there. Thanks Kristen for the beautiful post. My dear old 90 year old mama no longer asks why I bother with “all that writing.” I’m published several times over, and now the comment is, “You could write a real book if you were willing to make the effort.” If it weren’t for writin’ buddies I would have allowed that thinking to part me from what I enjoy most and find the most meaning in…. Some well meaning soul probably told Jesus to get a day job, too. Thank you, Kristen, for WANA, and for being yourself. WANA is totally a lifesaver. Whenever I’ve put something really vulnerable out on the web, it ends up being some of my most commented content because the WANAs are there RIGHT AWAY! And I consider so many of them, whether I’ve met them or not, some of my closest friends. We send care packages and notes of encouragement, we’ve become critique partners, we have writing sprints, we’re cheerleaders, sounding boards, a support group, friends, we’re family. Thank you Kristen for providing that! And I’m glad we could be that for you too in tough times. I love your posts and have been following for quite awhile. I am ready to get more involved in WANA and hope to make some great friends here. This could not have been more timely. It’s November. My sister suggested that earning money might be more important than writing. The days are short. The dream feels shredded. Thanks for the encouragement. I was planning on starting with a clever riff on “procrastination”, but I procrastinated too long and lost the thought. I hope that the person who stumbles upon my blog by accident clicks through to the real inspiration. We are all scared. I know there are times I absolutely hate every single word I write on my NaNo novel. But you know what? I still love my characters. And abandoning the novel would mean giving up on them. Somehow that makes me feel even worse than the words I put on paper. So I push on. I want to tell their story, even if it’s told badly at first. So don’t give up. No matter what. Just keep going. Who knows, when you reread your manuscript come December, you might find that it’s not so bad after all. Love your post! It is so hard to ‘choose’ to write, follow your dream, when you really should be out there at a ‘real job’. Yay for all the support! I am awed and amazed at your compassion, accuracy and total grasp of the struggle writers face as they try to maintain their dignity and hold onto their hopes and dreams of success at what they love to do the most. All that you said is true-and more. I never expected to write my novel and have it picked up by the first editor I submitted to. Or the second, third or twentieth for that matter. I had heard all the truths about publishing. What I wasn’t ready for was the broken system for writers as far as traditional publishing avenues. No one wants to accept new authors and yet you cant become “known” without being published, you dot every i and cross all the t’s, format your work ten different ways for ten different companies, and some of the rejections cone back so quickly you doubt your work was ever even cracked open. Or there are the pseudo traditional companies that end up making an offer if only you pay for nearly everything and they have a big guarantee of sales.and I cant even face the e book route yet. I have never been a hawker, salesman or promoter and that process seems never ending. It isn’t about doing real work. It is about the “game” of publishing. That is why I gave up and began to publish my novel on my blog, a chapter at a time because I truly would like someone to read it. It is a good story and has a message that I want to share. I only minimally considered income from sales. Writers really want to leave an imprint, make a difference, and share their expression. Thank you for caring and showing it. All the best to you with this project and your own personal gaols. You are quite the inspiration! I stumbled upon your blog a year or so ago and later followed you on FB. My story is a long and winding one. Bottom line I’m finally nearly done with the first draft of my novel after, ahem, 10 years of starting and stopping. Your info and more so your spirit have continually nudged me forward when I felt like giving up. So don’t you dare quit! I’m on target to have this dang draft done by the end of the month! Finally! So thanks for all those nudges and nuggets if wisdom that helped me keep my writing dream alive! Hope to meet you one day and chat it up, toss back a few or both! Press on mama you’re fab! That’s why again I say thank you!! Just hit the ‘like’ button, but wish there was a ‘love’ button. It is amazing how digital support can be so much more real and consoling sometimes than that from live bodies around you. Luckily, I have a handful of friends that have always supported me unconditionally. That has meant the world to me. However, they are not writers. Sometimes, it takes a writer to understand the real ups and downs this career of words can take. And, sometimes, you have to go online to find that. myWANA is a brillant idea. Finished my blog entry for the week and this topic fit nicely with my thoughts on living your passion. See link to your blog post at PASSION: LIFE’S TOO SHORT TO LIVE WITHOUT IT, http://wp.me/p38f9n-2H. Thanks, Kristen. Awesome! Good for you for paying it forward, and good for the people who stuck by you. Loved the pictures with the flower pot! TERRIFIC POST, KRISTEN! Today is the day that your email message ‘Are We Really Thankful’ really touched me and had me turn to this post at your link WANA COMMUNITY. Feeling very much alone in my writing, Kristen. Have published a book, write reviews and articles on two Blogs, started a Facebook Page, and developed 3,000+ followers at Twitter over the years. How can I feel alone? I will read more of your posts and see how I can improve my direction. Thanks. I’m very late to the party – I’ve been a lurker for quite some time (years), but would now love to partake in the feast that is #MyWANA. You’ll see me on Twitter soon. Thanks for your terrific posts and your honesty and openness in sharing valued information. I hope to be a more active participant. I am so happy to have found this blog and your story about bullying. Bullying in the workplace is out of control! I’m a victim of it and it destroyed my career and sense of well-being. Finding your link on FB has given me back my hope–thank you! What a cool mission and a cool site. I even saw another man here. Loved your story. I’m a new author and evn though the book is pretty much done, I feel like I’m at the beginning of this process. Gonna join the email list. My writing coach recently told me that my writing was my art and may not include payment when I asked her about my becoming a published author some day. Wasn’t quite sure how to assimilate that into my dream of becoming a published author one day; MyWANA almost sounds too good to be true; a universe where people actually support each other to reach their dreams of becoming authors.